LASIK is an acronym describing each component that allows vision correction to be fast, accurate, and pain-free. Laser vision correction has been amazing since the early days before LASIK. Nothing, however, compares to the precision possible today with modern LASIK. LASIK is perhaps the most famous eye procedure of them all. It’s synonymous for many people with the word “laser.” But the acronym has much more to it than just laser. Specifically, it is Laser Assisted In situ Keratomileusis. Granted, that confuses the issue much more than clearing it up. But it gives us something to work with to explain it. Let’s start at the end of the acronym. “Kerato” comes from the Greek word for cornea. Mileusis means we’re reshaping it. Why would that help? Well, the cornea is a clear dome on the front of the eye. And that makes it a lens. If someone is nearsighted, then it means that lens — that cornea — is too strong. It’s too strong because it’s too steep. If it gets reshaped (to make it flatter) then the nearsightedness goes away. In situ just means this is done while your alive and well. That’s a small but important part of this acronym. In situ means that afterwards, you can go out and use your new eyes to see the world. 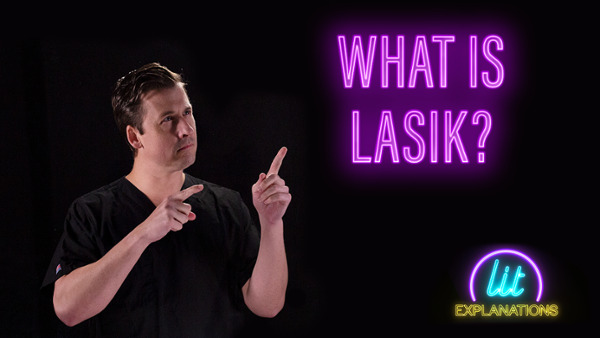 Lastly, we come to the first words of the acronym for LASIK. This words are Laser Assisted. Lasers allow for indescribable accuracy. I don’t mean that figuratively. It’s impossible to fathom changes so precise that we measure them in fractions of a thousandth of a millimeter. There are two lasers that each contribute, or assist, in LASIK. The laser that fixes the vision is called an excimer laser. It reshapes the permanent layer of your cornea — called the stroma — to make your eye focus correctly. You can think of it as putting your glasses prescription directly onto the front of your eye. That’s not exactly how it works, but in a roundabout way, it’s the same idea. You won’t need glasses anymore when you’ve already got eyes that have the right prescription. The other laser — called a femtosecond laser — makes recovery take hours instead of days. It creates a microscopic layer of bubbles between two of the natural layers of your cornea. It means the sensitive and smooth top layers can be moved out of the way. Then, the permanent cornea can be reshaped and the top layers can be replaced. It’s like we’re trying to fool the eye into thinking nothing ever happened. What’s amazing is how successfully that can be achieved. LASIK is an acronym describing each component that allows vision correction to be fast, accurate, and pain-free. Laser vision correction has been amazing since the early days before LASIK. Nothing, however, compares to the precision possible today with modern LASIK. The scientific words that compose the acronym may not be of lifelong significance, but the results possible because of those scientific advances definitely are.